Our Queensland Island hopping adventure - plus a CUTE Turtle Craft! Who doesn’t dream of Island holidays? I know I do! We try to take one good family vacation once a year but last year we were all so busy that we missed our regular ‘proper’ holiday…the only good thing that came from that was having a little extra money to put towards this year’s adventure! We took close to three weeks off and decided to take a ‘road trip’ up the Queensland Coast, we planned our accommodation to break up the long travel times between the Sunshine Coast to the Whitsundays, this enabled us to visit some areas of Queensland we’d never seen before. Our first destination was Heron Island, a small Island two hours boat ride from Gladstone. I first discovered Heron Island through Instagram – we follow a fabulous travel photographer Mark Fitz and it was his fabulous underwater photos that inspired our visit. 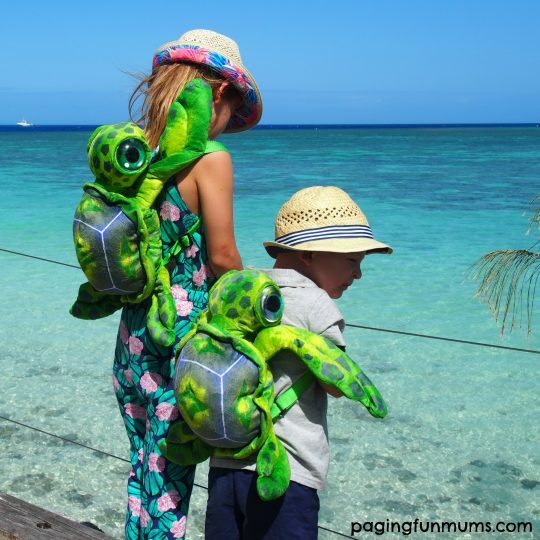 I booked our room easily online and decided to go with the Turtle package from their online specials as it boasted family friendly rooms and activities – kids 12 and under stay and eat breakfast free plus they get these cute Turtle backpacks as a keepsake! Unfortunately it was very windy at the time of our departure and the boat ride turned out to be quite the adventure in itself! Luckily none of my family suffer from sea sickness, the kids thought the big waves were “AWESOME”. We were greeted with fancy mocktails and given all the important information to make our stay enjoyable before heading to our room to quickly change into our snorkelling gear! The snorkelling did not disappoint and I’m happy to report we saw many turtles whilst swimming and also from the beach. We were even lucky enough to witness them mating in the shallow protected waters – which lead to some interesting conversations with the children. Heron Island is a small Island, you can walk around it in 20mins if you wanted to, we took hours wandering, exploring and learning. The bird life is EVERYWHERE, be prepared to cop a few droppings as you walk under the trees. The atmosphere is relaxing and tranquil, you can choose to do very little or go all out with the activities around the island. We really enjoyed our stay and would love to return when the baby turtles are hatching. You can read more about Heron Island and make bookings here. You might also enjoy reading this review posted by our blogging friend Chantelle at Fat Mum Slim. We made a quick stop at one of our favourite family friendly caravan parks at Yepoon to break the long drive to Airlie beach. Coolwaters has a huge range of accommodation from camping to deluxe family cabins, the biggest draw card for my family is their fantastic waterpark! We then spent several days exploring Airlie Beach and fishing in Peter Faust Dam for Barramundi. The kids were pretty impressed with Dad’s catch and enjoyed studying it before we released it back into this picturesque lake. Daydream Island – We’ve visited Daydream Island a few times in the past fir day trips but this would be the first time we have actually stayed at the resort. Daydream Island is not far from Airlie beach (a quick ferry ride) making it a lot easier to access than Heron Island. Daydream has a MASSIVE variety of activities for families, I think it would almost be impossible to do all of them unless you stayed for a month! It has more of an upbeat atmosphere with plenty of dining options and plenty of large swimming pools. The grounds and gardens are immaculate and full of wallabies! They are also in the process of renovating the accommodations (the Island was recently sold so the new owners are making some exciting changes), we stayed in a recently renovated Ocean view room that had spectacular views over the Whitsundays. I took the opportunity to go for a helicopter ride around the Island with my daughter and the view was out of this world! We also enjoyed the glass bottom boat trip around the Island – we learnt so much on that FUN trip and my kids even had a turn driving the boat! Queensland really does have some of the most beautiful landscapes, green mountain islands, coral reefs and aqua blue waters! Daydream Island conduct daily fish feeding tours from one of their beaches, aptly named ‘Lovers Cove’. The fish go CRAZY for the food and it’s such a FUN way for the children to see the coral fish up close without snorkelling. The snorkelling is also amazing with some coral reef located a stones throw from the beach! My seven year old daughter fell in love with snorkelling here and cannot stop talking about it. 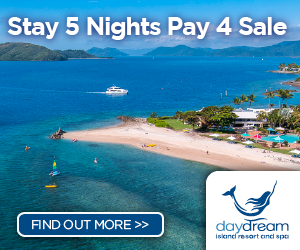 Daydream Island have a fantastic offer going at the moment so it’s a great time to take the family away and experience this beautiful part of the world yourself! Click here for all the details. Cut one egg holder from the carton and cover with bubble wrap (we used tape to secure it underneath), paint it with green paint and allow to dry. Cut the under-body and flippers from the top cover of the egg carton, paint brown and allow to dry. Then it’s a matter of gluing the eyes to the pom pom and gluing all the pieces together as shown below. Simple. 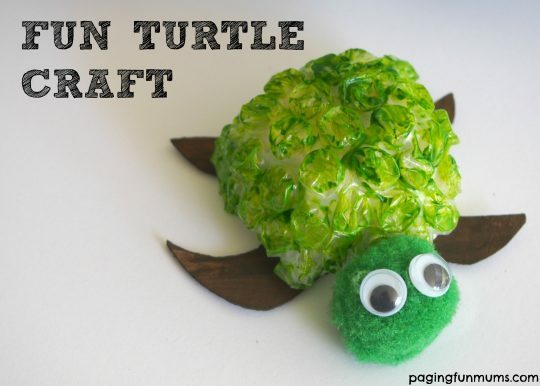 This is also a great craft to talk about recycling and the dangers that rubbish has on our environment. Plastic in the ocean can often me mistaken for jelly fish and is responsible for killing hundreds of turtles :(. We hope you enjoyed reading about our holiday adventure and perhaps go forward to book your own! This post was not sponsored and we paid for our holiday, we do love to share our adventures if we feel our wonderful readers would also enjoy these destinations. We also love to support our home state and promote Queensland Tourism. « The day my baby nearly died in his car seat.